REAL C.D. DE LA CORUÑA SAD 3 - 2 REAL ZARAGOZA S.A.D. ATHLETIC CLUB 1 - 1 REAL SOCIEDAD S.A.D. CELTA DE VIGO SAD 2 - 3 BARCELONA F.C. REAL ZARAGOZA S.A.D. 3 - 0 ESPANYOL R.C.D. LEVANTE U.D.SAD 1 - 4 REAL MADRID C.F. GETAFE C.F. SAD 1 - 0 REAL RACING CLUB S.A.D. BARCELONA F.C. 3 - 0 OSASUNA C.A. REAL MADRID C.F. 2 - 0 REAL SOCIEDAD S.A.D. REAL RACING CLUB S.A.D. 0 - 3 BARCELONA F.C. REAL C.D.MALLORCA SAD 1 - 0 ESPANYOL R.C.D. VILLARREAL C.F. SAD 3 - 2 REAL ZARAGOZA S.A.D. REAL BETIS BALOMPIE SAD 0 - 1 REAL MADRID C.F. GIMNASTIC DE TARRAGONA SAD 2 - 2 REAL RACING CLUB S.A.D. CELTA DE VIGO SAD 0 - 2 OSASUNA C.A. REAL C.D. DE LA CORUÑA SAD 2 - 0 REAL SOCIEDAD S.A.D. ATHLETIC CLUB 1 - 3 BARCELONA F.C. ESPANYOL R.C.D. 0 - 0 OSASUNA C.A. VILLARREAL C.F. SAD 0 - 0 ESPANYOL R.C.D. REAL SOCIEDAD S.A.D. 1 - 3 REAL ZARAGOZA S.A.D. GETAFE C.F. SAD 1 - 0 REAL MADRID C.F. OSASUNA C.A. 0 - 1 REAL RACING CLUB S.A.D. REAL C.D.MALLORCA SAD 0 - 0 REAL SOCIEDAD S.A.D. REAL MADRID C.F. 2 - 0 BARCELONA F.C. VALENCIA C.F. SAD 1 - 0 OSASUNA C.A. ESPANYOL R.C.D. 2 - 2 REAL RACING CLUB S.A.D. LEVANTE U.D.SAD 0 - 0 ESPANYOL R.C.D. ATLETICO DE MADRID C. SAD 0 - 1 REAL ZARAGOZA S.A.D. GIMNASTIC DE TARRAGONA SAD 1 - 3 REAL MADRID C.F. LEVANTE U.D.SAD 2 - 0 REAL SOCIEDAD S.A.D. REAL C.D. DE LA CORUÑA SAD 1 - 1 BARCELONA F.C. SEVILLA F.C. SAD 2 - 0 OSASUNA C.A. ATHLETIC CLUB 0 - 0 REAL RACING CLUB S.A.D. REAL SOCIEDAD S.A.D. 1 - 1 ESPANYOL R.C.D. BARCELONA F.C. 3 - 1 REAL ZARAGOZA S.A.D. OSASUNA C.A. 1 - 4 REAL MADRID C.F. REAL C.D.MALLORCA SAD 1 - 4 BARCELONA F.C. REAL CLUB RECREATIVO DE HUELVA 2 - 0 OSASUNA C.A. REAL MADRID C.F. 3 - 1 REAL RACING CLUB S.A.D. REAL BETIS BALOMPIE SAD 1 - 1 ESPANYOL R.C.D. ATLETICO DE MADRID C. SAD 1 - 1 REAL SOCIEDAD S.A.D. CELTA DE VIGO SAD 1 - 1 REAL ZARAGOZA S.A.D. VALENCIA C.F. SAD 0 - 1 REAL MADRID C.F. LEVANTE U.D.SAD 1 - 1 BARCELONA F.C. REAL ZARAGOZA S.A.D. 1 - 2 OSASUNA C.A. REAL C.D. DE LA CORUÑA SAD 0 - 0 REAL RACING CLUB S.A.D. ATLETICO DE MADRID C. SAD 1 - 2 ESPANYOL R.C.D. BARCELONA F.C. 1 - 0 REAL SOCIEDAD S.A.D. REAL RACING CLUB S.A.D. 0 - 2 REAL ZARAGOZA S.A.D. SEVILLA F.C. SAD 2 - 1 REAL MADRID C.F. REAL BETIS BALOMPIE SAD 1 - 1 BARCELONA F.C. VILLARREAL C.F. SAD 1 - 4 OSASUNA C.A. REAL C.D.MALLORCA SAD 1 - 2 REAL RACING CLUB S.A.D. ESPANYOL R.C.D. 0 - 1 REAL MADRID C.F. GETAFE C.F. SAD 0 - 1 ESPANYOL R.C.D. CELTA DE VIGO SAD 0 - 0 REAL SOCIEDAD S.A.D. ATHLETIC CLUB 0 - 0 REAL ZARAGOZA S.A.D. GETAFE C.F. SAD 1 - 1 BARCELONA F.C. REAL SOCIEDAD S.A.D. 2 - 1 OSASUNA C.A. LEVANTE U.D.SAD 2 - 0 REAL RACING CLUB S.A.D. REAL C.D. DE LA CORUÑA SAD 2 - 0 REAL MADRID C.F. ESPANYOL R.C.D. 3 - 1 BARCELONA F.C. REAL RACING CLUB S.A.D. 1 - 0 REAL SOCIEDAD S.A.D. REAL MADRID C.F. 1 - 0 REAL ZARAGOZA S.A.D. ATLETICO DE MADRID C. SAD 1 - 0 OSASUNA C.A. REAL BETIS BALOMPIE SAD 1 - 1 REAL RACING CLUB S.A.D. REAL C.D.MALLORCA SAD 0 - 1 REAL MADRID C.F. REAL C.D. DE LA CORUÑA SAD 0 - 0 ESPANYOL R.C.D. VILLARREAL C.F. SAD 1 - 0 REAL MADRID C.F. ATLETICO DE MADRID C. SAD 1 - 1 REAL RACING CLUB S.A.D. GETAFE C.F. SAD 2 - 0 OSASUNA C.A. GIMNASTIC DE TARRAGONA SAD 4 - 0 ESPANYOL R.C.D. ESPANYOL R.C.D. 1 - 2 REAL ZARAGOZA S.A.D. SEVILLA F.C. SAD 0 - 0 REAL SOCIEDAD S.A.D. OSASUNA C.A. 0 - 0 BARCELONA F.C. REAL C.D.MALLORCA SAD 2 - 1 REAL ZARAGOZA S.A.D. REAL SOCIEDAD S.A.D. 1 - 2 REAL MADRID C.F. BARCELONA F.C. 2 - 0 REAL RACING CLUB S.A.D. GIMNASTIC DE TARRAGONA SAD 2 - 3 OSASUNA C.A. CELTA DE VIGO SAD 0 - 2 ESPANYOL R.C.D. REAL CLUB RECREATIVO DE HUELVA 1 - 0 REAL SOCIEDAD S.A.D. VALENCIA C.F. SAD 2 - 1 BARCELONA F.C. LEVANTE U.D.SAD 0 - 0 REAL ZARAGOZA S.A.D. ATLETICO DE MADRID C. SAD 1 - 1 REAL MADRID C.F. CELTA DE VIGO SAD 2 - 2 REAL RACING CLUB S.A.D. OSASUNA C.A. 0 - 2 ESPANYOL R.C.D. REAL ZARAGOZA S.A.D. 3 - 2 REAL SOCIEDAD S.A.D. SEVILLA F.C. SAD 2 - 1 BARCELONA F.C. REAL RACING CLUB S.A.D. 1 - 0 OSASUNA C.A. REAL BETIS BALOMPIE SAD 1 - 1 REAL ZARAGOZA S.A.D. BARCELONA F.C. 3 - 3 REAL MADRID C.F. REAL RACING CLUB S.A.D. 1 - 1 ESPANYOL R.C.D. VILLARREAL C.F. SAD 1 - 1 REAL SOCIEDAD S.A.D. REAL CLUB RECREATIVO DE HUELVA 0 - 4 BARCELONA F.C. ATHLETIC CLUB 0 - 3 OSASUNA C.A. VALENCIA C.F. SAD 0 - 2 REAL RACING CLUB S.A.D. GETAFE C.F. SAD 2 - 2 REAL ZARAGOZA S.A.D. CELTA DE VIGO SAD 1 - 2 REAL MADRID C.F. VALENCIA C.F. SAD 3 - 2 ESPANYOL R.C.D. ESPANYOL R.C.D. 1 - 0 REAL SOCIEDAD S.A.D. REAL ZARAGOZA S.A.D. 1 - 0 BARCELONA F.C. REAL MADRID C.F. 2 - 0 OSASUNA C.A. SEVILLA F.C. SAD 0 - 0 REAL RACING CLUB S.A.D. REAL BETIS BALOMPIE SAD 0 - 1 REAL SOCIEDAD S.A.D. GIMNASTIC DE TARRAGONA SAD 1 - 0 REAL ZARAGOZA S.A.D. REAL RACING CLUB S.A.D. 2 - 1 REAL MADRID C.F. ATHLETIC CLUB 2 - 1 ESPANYOL R.C.D. VILLARREAL C.F. SAD 2 - 0 BARCELONA F.C. REAL C.D. DE LA CORUÑA SAD 1 - 0 OSASUNA C.A. REAL CLUB RECREATIVO DE HUELVA 4 - 2 REAL RACING CLUB S.A.D. GETAFE C.F. SAD 1 - 0 REAL SOCIEDAD S.A.D. OSASUNA C.A. 2 - 2 REAL ZARAGOZA S.A.D. ATHLETIC CLUB 1 - 4 REAL MADRID C.F. SEVILLA F.C. SAD 3 - 1 ESPANYOL R.C.D. REAL SOCIEDAD S.A.D. 0 - 2 BARCELONA F.C. REAL C.D.MALLORCA SAD 3 - 1 OSASUNA C.A. REAL ZARAGOZA S.A.D. 0 - 0 REAL RACING CLUB S.A.D. GIMNASTIC DE TARRAGONA SAD 1 - 3 REAL SOCIEDAD S.A.D. VALENCIA C.F. SAD 2 - 0 REAL ZARAGOZA S.A.D. REAL MADRID C.F. 4 - 3 ESPANYOL R.C.D. ATLETICO DE MADRID C. SAD 0 - 6 BARCELONA F.C. LEVANTE U.D.SAD 1 - 4 OSASUNA C.A. VILLARREAL C.F. SAD 2 - 1 REAL RACING CLUB S.A.D. REAL CLUB RECREATIVO DE HUELVA 2 - 3 REAL MADRID C.F. OSASUNA C.A. 2 - 0 REAL SOCIEDAD S.A.D. SEVILLA F.C. SAD 3 - 1 REAL ZARAGOZA S.A.D. REAL CLUB RECREATIVO DE HUELVA 0 - 1 ESPANYOL R.C.D. BARCELONA F.C. 2 - 2 ESPANYOL R.C.D. REAL BETIS BALOMPIE SAD 0 - 5 OSASUNA C.A. REAL SOCIEDAD S.A.D. 0 - 0 REAL RACING CLUB S.A.D. REAL ZARAGOZA S.A.D. 2 - 2 REAL MADRID C.F. 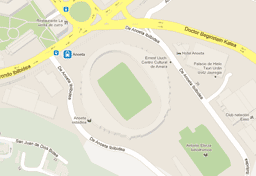 GIMNASTIC DE TARRAGONA SAD 1 - 5 BARCELONA F.C. VALENCIA C.F. SAD 3 - 3 REAL SOCIEDAD S.A.D. REAL CLUB RECREATIVO DE HUELVA 1 - 1 REAL ZARAGOZA S.A.D.